Our Executive Team | Central Coast Senior Services, Inc.
John O’Brien brings more than 25 years of professional experience in the health care industry to his role as CEO of Central Coast Senior Services, Inc. (CCSS). He is responsible for the design, promotion, and delivery of quality CCSS programs, products, and services. Mr. O’Brien ensures that the human resources, administration, client services, and education divisions of the company operate cohesively. A graduate of the University of California, Santa Cruz, Mr. O’Brien has a wealth of experience in home health care. Prior to establishing Central Coast Senior Services, Inc. in 1996, he worked as Vice President and Director at Community Home Care, Inc., Director of Case Management at Country Home Care, Director at Cresscare Case Management and Director of Senior Supportive Services at Alliance on Aging. He serves on the board of several local agencies and nonprofits. Susan O’Brien is Vice President of Human Resources for the past fourteen years. In that role, she is responsible for developing policy and directing human resources activities. Susan’s prior healthcare experience includes 20 years as a surgical technician and office manager for a large, multi-office oral surgery practice. 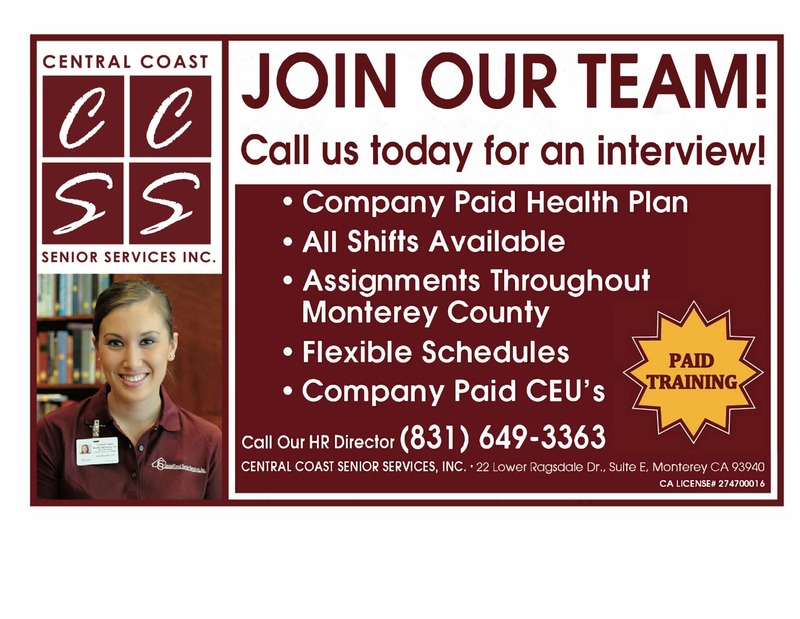 She is a member of the Society for Human Resource Management and the Central Coast Human Resource Association. Mrs. O’Brien has volunteered for the SPCA of Monterey County, Monterey Bay Aquarium, and Coalition for Companion Animals, and has participated in the Meals on Wheels’ Women Who Care campaign. Mrs. O’Brien was a member of the Monterey County Animal Control Advisory Board, and is a Board member of the Arthritis Foundation Central California Chapter in Monterey County. Valerie Graber, Chief Operating Officer, provides oversight to Central Coast Senior Services, Inc.’s frontline staff and daily operations. Valerie joins the team after serving as the Chief Operating Officer for the Aging & Adult Care of Central Washington. Her 20 years experience in the field of aging with a Bachelor of Arts in Psychology and a Masters of Education in Guidance and Counseling make her an incredible asset to the Executive Team. Faith Beety, Director of Human Resources, is responsible for the administration of the Human Resources Department activities such as employment, compensation, labor relations, benefits, and employee services. Faith worked for 16 years as Director Human Resources at Central Coast Visiting Nurses Association and Hospice and has a deep understanding of the unique needs of our employees and the clients we serve. Faith holds a certificate from SHRM as a Senior Certified HR Professional. Micheal Armstrong, Director of Finance, is a lifelong resident of the Monterey Bay area, Michael has a deep appreciation for the Central Coast and the diversity of people and organizations that make it special. Prior to joining Central Coast Senior Services in 2012 as Finance Director, he successfully led and managed the finance and accounting functions for public and private sector companies. For the past thirty years Michael as been a crucial part of management teams that have driven growth, profitability, internal controls and best practices. Aimee Cuda, Community Relations Manager, comes to the team with thirteen years’ experience in development and related fields including work at ITN Monterey County, Voices for Children – CASA, The First Tee of Monterey County, The Carmel Foundation, and York School. Her experience includes annual fund development, planned giving, donor relationships, community outreach, board cultivation, non-profit management, strategic planning, and event planning. Aimee graduated from the Community Foundation for Monterey County’s LEAD program in 2011 and completed her Bachelor of Science in Human Services/Management in December, 2014.